What used to be pretty well accepted as “normal” life is likely where we’re all headed—tougher times. Most people deluded themselves into believing that the last several decades of post-modern decadence would last forever. It was the “easy life” characterized by a second mortgage-credit card existence securely tucked in an endless immigrant-groomed suburbia and required little more than showing up for some completely unproductive and over-paid 9 to 5 job. The denizens produced absolutely nothing of tangible value, and that era is crashing to a close. High five and six-figure salaries are vaporizing like the morning fog off river bottoms, as the harsh light of economic reality burns the hazy illusions away. When you have off-shored the manufacturing of products that have true and measurable value, and the Corporatists have turned our formerly productive economy into one based on nothing but “service”, well, we can only wash each other’s clothes for so long before the money runs out. The multiplier effect is dead, particularly once you have to import the soap. “Hard Scrabble Times” alright, maybe even the “Real McCoy” of economic depression is probably what awaits. The last President who ascended to power after the wheels had come off the economy once said, “Nothing happens in politics that isn’t planned.” Economics and politics are pretty well all intertwined these days, just as they were back in 1933. Who am I—a lowly occasional scribe and creature of the land—to argue with such a respected intellect and connected man as F.D.R., therefore I shall simply agree with his premise. Men with plans perhaps nefarious, best laid, now coming to a devastating fruition. “What,” you are thinking, “does this presumptuous preface have to do with a ‘Homestead Tractor’?” Everything. Literally everything. Let’s face it: either consciously or subconsciously, the folks reading this never really trusted that the economic fantasy that became America could last. That conscious call back to the land was also a silent plea from our souls, to make and live lives that had real meaning and connection to real things of substance. We desired a quality of life based not on the size of one’s Flat-Screen Television, but of relearning and understanding the processes of “doing things” with your own hands side-by-side with those of your family. The pursuit of the re-establishment of the “Land Ethic” in one’s being. The turning of the sweet-smelling earth in the spring followed by the musty scents of the remains of a garden being turned back over to the earth again in the fall. When those of us who choose homesteading as a lifestyle, rejecting the robotic regimentation required by corporate existence, our first thoughts after careful consideration of the land we purchased should have been what sort of equipment we need to make this adventure work. Invariably, we think “tractor”. An old Ford 8N or 9N, perhaps even a Massey-Ferguson 35, a Ford Jubilee or maybe one of those sweet 861’s. If blessed with good fortune, you go buy a new Kubota or a Deere. All is well. It doesn’t take long to figure out that as “compact” as some of these tractors are, there is simply a whole bunch of stuff they just cannot do. They are a bit too big in practical terms. Of course they can go cut down the tall grasses and the smaller shrubbery with the old Bush Hog, run the post-hole digger, do some plowing, and scrape some snow away. If you have one with a loader, well, you wonder how you ever got along without it. But in real terms, size matters, and sometimes they’re just “too much gun”, and not nearly as versatile as one would hope. So something smaller, much smaller, is in order for things like plowing, roto-tilling and row cultivating the garden, plowing snow in either confined or large locations, even blowing the snow if necessary. Mowing the lawn and maybe even it can, too, cut that tall grass and shrubbery. Something with a small bucket to work the manure inside the small animal runs, and maybe even run a chipper-shredder. Perhaps one that a generator can be hooked-up to, and even a water pump, and a little cart to haul tools and firewood around. One even with a log splitter? Maybe one I could haul a little sprayer behind to hit that orchard and shoot those weeds down. Does anybody make such a thing? No. But they used to. It had it’s beginnings in 1916 as “The Gravely Motor Plow”, when the U.S. Patent Office granted Benjamin Gravely a patent on a design he had come up with that featured a one-wheeled plow powered by a 2 ½ horsepower “Indian” motorcycle engine. He was the first person to design a mechanized plow for the small plot farmer, and as usual, by necessity, he had been the father of invention. Quintessentially American. Gravely had a couple of acres in Dunbar, West Virginia, and he was determined to tinker up a design to motorize the little hand-pushed plows that produced little but aching muscles and bad backs, and not much else. Sure, a fellow could break up a bit of a garden spot with them, but they were barely more productive than a shovel. A friend of his had given him the old engine, and after a couple of years of trial and error, the two acres had been cultivated by a reliable little machine. Small plot farming was about to be revolutionized, and by 1922, the single-wheeled Gravely “Model D” was in full factory production and selling like proverbial hotcakes, wooden handles and all. It wasn’t long after, about 1928 or so, that Gravely decided he could engineer up a power take-off to the front of the machine. 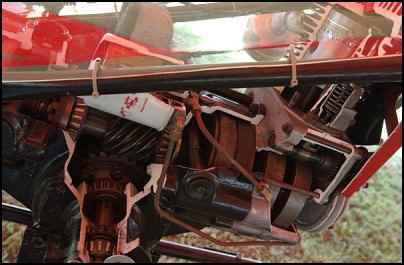 It was an all gear drive unit to which he mounted a sickle bar. No belts, all gears. Versatility to the machine was now in place, but the original design lacked a robust frame that could withstand the vibrations of powered implements, as well as being limited to but a single speed. And then there were still those wooden handles. On came The Great Depression, and at roughly the same time came the first of the Model L’s. One could argue that the timing could not have been worse to introduce a new product. The Model D had retailed at $179.00, which was hardly inexpensive in the late twenties-early thirties. The “L” was priced in a couple multiples of that figure, and with the financial world crashing down to earth as the twenties roared to a close, it was questionable as to whether Gravley Tractor and the new Model L would survive the coming crisis. The “L” arrived in production in 1933, and was so different than the “D” that no one would even presume they were of the same lineage. It had two opposed wheels replacing the single, and an all-gear, two-speed forward and reverse cast iron transmission with an integral gear-driven, two-speed p.t.o. directly mated to a 5.5 horsepower engine. The handles were now steel rather than wood, and you could order the machine with a pair of the steel-cleated wheels the Model D had featured, or pneumatic rubber tires instead. Further, there was a line of both powered and towed implements of such great number that the little tractor was literally a mechanized version of a Swiss Army Knife. This wasn’t just progress, it was a quantum leap forward that no other manufacturer ever really matched. Even during the Depression the sales of the machine were solid, rising every year. 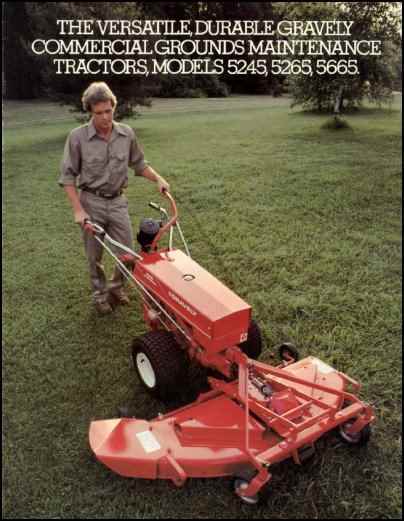 There wasn’t another lawn-and-garden machine that could approach its versatility, nor match its durability. Buyers could order gang-reel mowers as wide as 75” for the Estate Owners, or a thirty-inch reel or rotary for the Average Joe. Riding sulky’s could be attached to the rear of the machine for all-day comfort on big jobs. There was a sod-busting rotary plow that one could convert over to a roto-tiller or planting drill in a matter of minutes, using nothing more than 3/4” and 9/16” wrenches. 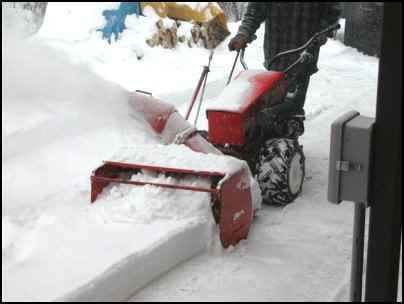 48” plowing blades were available for moving snow and dirt, as well as a 38” scoop bucket that dumped via a hand-lever attached to the left handle. The list of implements was seemingly endless. At one point there were over fifty implements available for the little tractor, from rear-attached, seated Hay Rakes to front mounted mowers, chainsaws, sprayers and chipper-shredders. Both the tractor and the implements were darn-near bulletproof. Every part was over-engineered, and in truth, Gravely’s biggest problem with selling newer tractors was that the old ones wouldn’t wear out. The wastefulness of the “throw away society” was still decades away, and “planned obsolesce” on the part of manufacturers was not part of the Gravely engineering culture. The changes made to the tractor from the mid-1930’s to the late-1960’s were focused mainly on increasing horsepower, as the little 5.5 horse engine grew to a 6.6, and then finally up to 7.6 horsepower. That was all they could squeeze out of that little block, and the tractor was about to get its first real makeover. Post-war prosperity was a double-edged sword in many ways. Along with that prosperity, the general toughness of the “American Character” began its slow decline, and with the advent of suburbia beginning with New York’s Levittown, the self sufficient small-plot farmer either moved to town or town moved over him. Concrete, asphalt, “Cookie Cutter” houses and Kentucky Bluegrass replaced the furrowed rows of beans, beets, and corn. Television and its namesake frozen dinners took the place of gardening and family conversation. Life was becoming “easy”. In this new style of existence, mowing a small lawn once a week with a 21” rotary was all that yard work really entailed. If a home garden was planted, it was small and tilled up with a cheap and generally undependable Montgomery Ward or Sears 5 horsepower unit with a Briggs and Stratton engine of questionable quality. Mini-estates began to appear, and the machines the owners purchased for maintenance were “tractors” in appearance only, with aluminum cased transmissions and axles driven by belts. They stuffed mowing decks under the belly of these poor imitators of farm tractors, and so far as implements available were pull carts, flimsy front blades, and on a few models, a rear roto-tiller. Mowing was about all they could accomplish with any competency. Sure, a person could hook up those roto-tillers to the back and a blade to the front, but that was about it. And Lordy, hooking up those tillers! There were multiple v-belts going this way and that, with enough length and pulleys at odd angles that by the time the power reached the tiller, half of it had to be gone! Real versatility and delivery of sure power was left to the Gravely. But as life shifted from pastoral landscapes and small agriculture to nothing but groomed lawns, the need for a wide range of versatility began to disappear. As Bob Dylan so wrote, the times, they were a-changing. When I was 11 back in ’66, my father purchased a used 1958 7.6 horsepower “L” model to use on his small acreage. An engineer by profession, but a farmer at heart, he was one of those men who was determined to “do it himself”, as well as instill in his children a solid work ethic and a connection to the land. 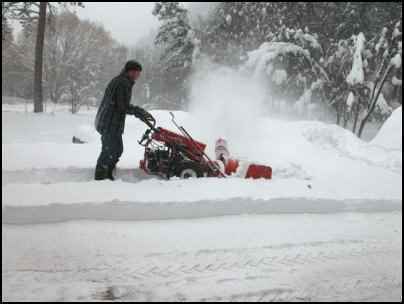 He bought the Gravely from a retired Air Force Colonel complete with the front plow blade, rotary plow and tiller, a 30” brush mower, and a riding sulky. I think maybe a couple hundred bucks brought it all home. That particular “L” was like most of them, a manual start unit. It required the fellow starting it to advance the crank by hand to a point where you felt the piston reach top dead-center, wrap a leather strap around the starter pulley, and give her a yank. If you did it right, it fired right up. If you did it wrong, the engine would turn back and about yank your arm right off. Getting it right regularly didn’t take long too figure out, believe you me. Another fun little feature was that leather starting strap. Back in the day, a kid might do something here and again to cause himself to understand that belts had multiple uses. Somewhat like starting the tractor wrong, lessons quickly learned from foolish behavior could keep the belt around someone’s waist, rather than gripped in the hand. I’m not being judgmental here, but we did have a lot less crime back then, and back-talking was just a tad less common than now. Leather and Lava soap. Maybe it was just me, being just a little kid starting that machine, but more often than not that leather starting strap would loose from that starter pulley after a hard yank, and it would slap across my back and just sting like the dickens! Sometimes I thought when it happened that perhaps I had maybe gotten away with something Dad and Mom didn’t know about, but God was there making darn sure I didn’t. I’m tellin’ you, I sure was happy when those electric starters came along. About 1970, Gravely Tractor introduced the “Commercial 10”, a ten-horsepower model powered by Kohler engines, and these new versions came with a two-speed axle, bringing the machines ground speed capability to four gears forward, four reverse. This series tractor soon included a both 8 and 12-horsepower models. Due to the increased horsepower availability, mower deck sizes jumped all the way up to 50” rotaries. 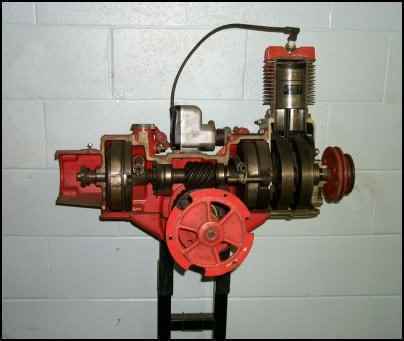 Because of Gravely’s habit of over-engineering everything, even with the increased horsepower, older implements were completely compatible even with the increased torque from the Kohler engines. And, much to my relief, those electric starters were standard on all models! The hoods had been changed to a more modern design, and the fuel tanks, formerly exposed, were tucked neatly underneath. There was a bit of tinkering with them over the years, such as changing the design of the axle-hubs and such, as well as meeting government safety requirements. Every now and again Gravely would change the nomenclature. The “Commercial 12” became the “5665”, and after some additional changes meeting more government operator safety demands, it eventually became the “Professional 12”. At a point they even stuffed a 16 horsepower Kohler on them, which was shortly thereafter changed to the Briggs and Stratton V-Twin Vanguard. Talk about an animal! The huge engines required a new hood design, and all the high-powered ones came with an axle-brake to assist with control. The apex of Gravely engineering on the two-wheeled “Convertible Tractor” had been reached. When I was a young lad, kids did all kinds of odd jobs, from tossing newspapers, to shoveling snow, cleaning out barns and stalls, running little lawn mowing businesses, all of these on top of regular chores. Almost no one was “too good” to be engaged in this meaningful exercise of learning life’s important lessons, and almost no job was “beneath” anyone. The weekly allowance was generally a pittance of a sum that didn’t go far, and spending it all in one place was pretty darn easy. Supplementing the allowance with hard work was the only way to go to the movies, hit the soda shop, or anything else. We knew how to work and no one complained—much, anyway. Nowadays, what you see in American youth is general sloth hanging out at the malls, minds being drowned in the incessant drumming from iPods, cars simply given to them, and their parents keeping them flush with unearned cash. For a tractor like the Gravely Convertible to maintain economic viability and remain in production, like anything else, it requires purchasers. The main buyers of these tractors came from three demographics. First, was the small acreage farmer and homesteading type – the fellow who did all his own work and needed a machine that would “do it all”. Second, would be the upper-end residential owner who not only had a nice lawn, but gardened extensively as well, and did all the necessary maintenance on his grounds by himself or utilized the help of the members of his immediate family. Slipping in third on the purchaser list was a combination of maintenance contractors and municipalities who required the versatility and durability the machinery offered. All three of these groups changed dramatically over the last couple of decades, but the change in the nature and composition of the first two groups is what ended production of these great machines. 2003 was the final year of manufacture for the little tractor. Over the years the Gravely product line had diversified to meet changing markets, and they remain a manufacturer of some of the best commercial mowers made. Flat-out good stuff. But that’s the catch—commercial mowers. Demographics. Mowing and little else. And by 2003, the demand for the little tractor and its implements could no longer justify further production. These little tractors were always expensive, but you got what you paid for. They did what you asked every time, and rarely ever broke down. I bought my first one in 1987, and now own four of them, along with somewhere around fifteen implements. I doubt that in twenty plus years of ownership I’ve spent over a five hundred dollars on parts outside of tires and batteries on all of them combined. Three hundred bucks of the parts expense was for new roto-tiller tines, but I live in a rock-pile, so that expense was to be expected. Dad, now 83, has five of them including his first 1958 “L” model, and it still runs like a clock. That’s reliability. I purchased a “Professional 12” model in really good shape on eBay for $600.00 in 2001. New, it would have run me close to $5,000. I bought my last Gravely on eBay, a 2003 model in mid-03′ with 70 hours on it from a fellow in Virginia for $3,000. It is a 14-horse model, with steering brake and special order wheels and tires that listed at almost $6,000 new. What a bargain! A month later the fellow called me and told me Gravely had quit producing the tractor, and if he had known he never would have sold it to me. I wasn’t prepared for the news he gave me, but sure enough, he was right. The little tractor was no more. My father was pretty well furious about the circumstance. His father had owned them as well, and an era had drawn harshly to a close. American small agriculture and its associated manufacturing culture was dying right in front of our eyes. Somehow, he could not understand why this had happened. I had given the matter some deep thought, and in conversation with him pointed out that of of his six children, I was the only one who owned enough dirt to justify owning one. All the rest lived in small-lot suburbia in oversized houses, their gardens suited to nothing more than a Mantis tiller, and two of them used mowing services to cut their mini-lawns. 8 to 5 soccer moms and 8 to 5 NFL-watching dads. That is what has become of America. Who needs a great little tractor when there is nothing left for it to do? As you can tell by these photos, these are absolutely wonderful machines. There are none better and certainly none more versatile. Ebay is loaded with the tractors and has implements galore. The manuals for virtually everything are available online, and there remains a steady supply of repair parts if, and when, one breaks. Richards Lawn and Garden (Google it) carries about everything you could ever need, and they are real fast on the shipping. YouTube even has videos of these tractors in action, and believe me, after seeing, you will become a believer. We are heading back to those hard-scrabble times of yore, and I do pity those who folks who live in town. The possibility of soup kitchens and bread lines is not as remote as one might think, but then, the mind is adept at denying the obvious. It’s a peculiar sort of survival mechanism until you actually need to survive. And that is why I wrote this, because the Gravely Convertible Tractor is a real survival mechanism, and you may well need one to survive. Give it serious and due consideration for your homestead needs. You won’t be disappointed. Gravely: The best little tractor a homesteader could ever have.